The Fourth Industrial Revolution is changing the way we receive information, how we process it, how we work and what jobs we will do. It is happening at an unprecedented pace. Because of this, we simply cannot afford to have any less than our whole population engaged and contributing. This Woman’s Day we have decided to focus our attention on women in tech and finding solutions to get more women into the industry. Whether they are software developers, entrepreneurs, marketers or operational managers; women have an important role to play in IT. Marian Wright Edelman once said “You can’t be what you can’t see”. Knowing what opportunities are out there is an important step in getting more women into technology roles. Introducing girls to IT and encouraging them to take STEM subjects through high school is important in decreasing the gender gap and getting more girls on board. Many girls’ schools in South Africa have introduced IT and computer science classes to their curriculum, giving girls more opportunities to join the tech industry. Helping to keep them educated and being involved in hackathons, and coding camps can help grow their interest in tech. A study at Stellenbosch University revealed that from an early age the gender stereotype of boys being better at science and maths often discourages girls from studying STEM subjects, but by grade 4 level, girls are already ahead of boys in mathematics. Studies have shown that women have an advantage which carries through from school level and continues to grow at each hurdle of the higher education process. 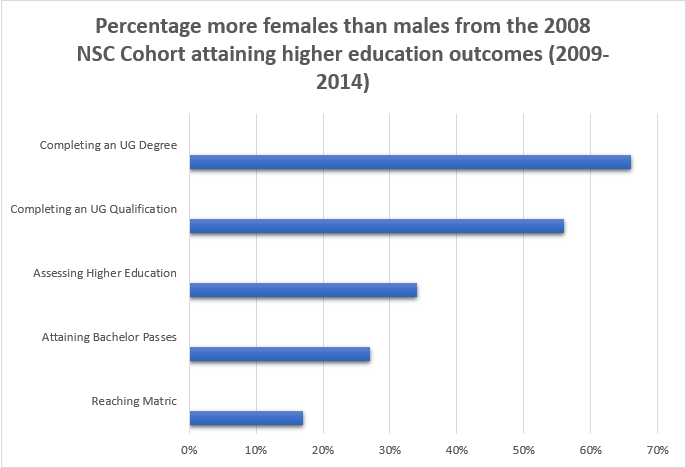 Relative to their male counterparts 27% more females qualified for university, 34% more enrol in university, 56% more complete any undergraduate qualification and 66% more who attain a bachelor’s degree. There are many women in leadership positions in the tech industry who are recognised globally. These women are inspirational. They share their knowledge and provide coding schools and clubs for women, giving them the opportunity to follow their dreams. Reshma Saujani is the founder of Girls Who Code and named one of Fortune’s World’s Greatest Leaders. She has written many inspirational books including Girls Who Code, and Women Who Don’t Wait in Line, in which she focuses on female leadership, embracing risk and failure, promoting mentorship and sponsorship and boldly charting your own course. She inspired millions in her TED Talk on teaching girls bravery, not perfection. Baratang Miya is the CEO of Girl Hype, a non-profit organisation that teaches young women how to code and develop apps. Baratang is a self-taught coder who grew Girl Hype out of her passion for diversity and the inclusion of women in the tech space. The coding clubs expose young women to technology and teach them the skills they need to begin a career in IT and empower them to inspire other young women through mentorship. Baratang has an inspiring story to tell the world. These are just two of the contemporary women in tech, but of course there are many more icons through history who changed the world. In an industry with such an enormous growth rate, it is important to get everyone on board. Women have the skills, determination and perseverance necessary to fill any role in tech. They may have had a slow start, but they are definitely capable of filling the shoes of any tech leader position. “Perfectionism prevents us from taking double steps in our career. We think we have to be perfect, but we don’t.” - Reshma Saujani, Founder of Girls Who Code. On that note, we wish all the women in tech a fantastic women’s day!